Climate Change in a Bottle | Whose Water? 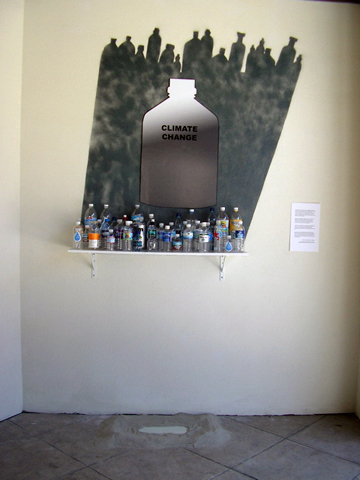 Climate Change in a Bottle was installed in the “Global Warming,”exhibition at the Orange County Center for Contemporary Art, Santa Ana, CA, in September 2007. Bottled water produces unnecessary garbage and consumes vast quantities of energy. Our installation addresses the effects of this worldwide industry on global climate changes. Right or commodity: Should government provide safe drinking water to the public, or is water a privilege, to be purchased? If public water districts pride themselves on providing safe drinking water, why do residents of major cities continue to purchase bottled water? Commodities without end: Deceptive marketing has contributed to the fetishization of bottled water, thus leading to the escalating consumption of non-biodegradable plastic. We are examining bottled drinking water as a contributor to global warming, from manufacturing of the plastic used in the bottles to transportation of bottles worldwide, including all fuel and pollution costs.